Consider a system of two objects of mass M. The two objects are attached to two springs with spring constants k (see Figure 1). The interaction force between the masses is represented by a third spring with spring constant k12, which connects the two masses. Figure 1. Two coupled harmonic oscillators. We note that the solution h1 corresponds to an asymmetric motion of the masses, while the solution h2 corresponds to an asymmetric motion of the masses (see Figure 2). Since higher frequencies correspond to higher energies, the asymmetric mode (out of phase) has a higher energy. Figure 2. Normal modes of oscillation. Coupled oscillations, involving a weak coupling, are important to describe many physical systems. For example, in many solids, the force that tie the atoms to their equilibrium positions are very much stronger than the inter-atomic coupling forces. In the example we discussed in the pervious section, the weak coupling limit requires that k12 << k. In this approximation we can show (see text book for details) that our solutions have a high-frequency component that oscillates inside a slowly varying component (see Figure 3). The solutions are thus sinusoidal functions with a slowly varying amplitude. Figure 3. Examples of solution in the weak-coupling limit. Reconsider the problem of two coupled oscillators discussion in Section 12.2 in the event that the three springs all have different force constants. Find the two characteristic frequencies, and compare the magnitudes with the natural frequencies of the two oscillators in the absence of coupling. This result reduces to for the case (compare Eq. (12.7)]. Solve this pair of coupled equations, and obtain the frequencies of the normal modes of the system. where corresponds to the symmetric mode and to the anti-symmetric mode. and the normal coordinates are proportional to x2 + x1 and x2 - x1. o The coupling in a system with two degrees of freedom results in two characteristic frequencies. o The two characteristic frequencies in a system with two degree of freedom are pushed towards lower and higher energies compared to the non-coupled frequency. In general there will be n different values of the angular frequency. These frequencies are called the characteristic frequencies or eigen frequencies. Depending on the coefficients, some of the characteristic frequencies are the same (this phenomena is called degeneracy). For each eigen frequency we can determine the ratio of the amplitudes; these amplitudes define an n-dimensional vector, also called the eigen vector. Note: the eigen vector has a pure harmonic time dependence. The general solution of the system is a linear combination of the solutions qi. Of course, it is only the real part of the solutions that is meaningful. Since there are n equations of motion, we also expect to see n normal coordinates, and n decoupled equations of motion. To illustrate the detailed steps to be followed to solve a coupled oscillator problem we will examine Example 12.4 from the textbook. In this example, the coupled pendulum shown in Figure 4 is examined. Figure 4. Coupled pendulum of Example 12.4. We have used the small angle approximation in order to express the sin and cos of the angles in terms of the angles. Each of these two equations tells us that a11 = a21. Each of these two equations tells us that a12 = -a22. 4. Determine the scale factors required to match the initial conditions. In this example, we do not need to match initial conditions (such as the initial displacement or the initial velocity and we thus do not need to determine scale factor). 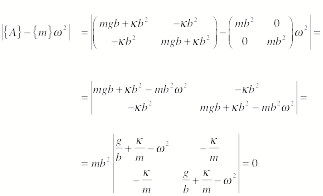 Note: the constants in these equations need to be adjusted to match the initial conditions. The system will carry out a motion with normal frequency 1 when h2 = 0. This requires that q1 = q2 and the motion is symmetric. The system will carry out a motion with normal frequency 2 when h1 = 0. This requires that q1 = -q2 and the motion is asymmetric. Our theory of coupled oscillations has many important applications in molecular physics. Each atom in a molecule has 3 degrees of freedom, and if we are looking at a molecule with n atoms, we have a total of 3n degrees of freedom. Three different types of motion can be carried out by the atoms in the molecule: translation (3 degrees of freedom), rotation (3 degrees of freedom), and vibration (3n - 6 degrees of freedom). Consider a linear molecule (the equilibrium positions of all atoms are located along a straight line) with n atoms. The number of degrees of freedom associated with Vibrational motion is 3n – 5 since there are only 2 rotational degrees of freedom. The vibrations in a linear molecule can be longitudinal vibrations (there are n - 1 degrees of freedom associated with this type of vibrations) and transverse vibrations (there are (3n - 5) - (n - 1) = (2n - 4) degrees of freedom associated with this type of vibration). If the vibrations are planar vibrations (the motion of all atoms is carried out in a single plane) we can specify any transverse vibration in terms of vibrations in two mutually perpendicular planes. The characteristic frequencies in each of these planes will be the same (symmetry) and the number of characteristic frequencies will thus be equal to n - 2. To illustrate molecular vibrations let us consider the dynamics of a triatomic molecule (see Figure 5). Figure 5. Vibrational motion of a linear triatomic molecule. In order to determine the normal modes, we will follow the same procedure as we used in the previous example (note: this differs from the approach used in the textbook). This equations tells us that a11 = -a31. Since the eigen vectors are orthogonal, we expect that the eigen vector for the second eigen frequency is given by a12 = a32. The system will carry out a motion with normal frequency 1 when h2 = 0. This requires that x1 = -x3 and the motion is asymmetric. The system will carry out a motion with normal frequency 2 when h1 = 0. This requires that x1 = x3 and the motion is symmetric. Note: the normal frequency 1 is equal to the frequency of a mass m on a spring whose other end remains fixed. This mode requires the central atom to remain fixed, and this can be achieved when the motion is asymmetric since the forces exerted by the two springs on the central mass cancel. The transverse vibration of the molecule can be specified in terms of a single parameter a. For this mode of vibration we will get a single "uncoupled" differential equation with a single corresponding characteristic frequency. The calculation of this frequency is shown in detail in the text book and will not be reproduced here. Find the eigen frequencies by solving the secular equation. 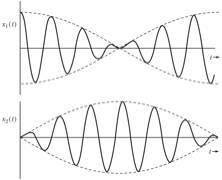 What is the physical interpretation of the zero-frequency mode? That is, the zero-frequency mode corresponds to a translation of the system with oscillation. A good model of an elastic string is a string of particles of mass m, each separated by a distance d (see Figures 6 and 7). We will assume that the tension in the string is constant and equal to t.
Figure 6. The loaded string. Figure 7. Calculation of the restoring force acting on mass j. · The masses can only move in the vertical direction (thus only the component of the tension in the vertical direction matters). · The potential energy of the system is the potential energy associated with the tension in the string. · We assume that the displacements from the equilibrium positions are small. · We ignore the gravitational forces acting on the masses (and the associated gravitational potential energy). Since there must be n eigen frequencies, we expect to find n distinct values of g.
where s = 1, 2, 3, …, n.
Note: the index runs from j = 1 to j = n + 1. There are no masses at position 0 and at position (n+1)d; these positions are the ends of the string. The displacement at these locations is equal to 0. We can solve this equation for w but the results are more difficult to interpret than the results obtained with out first approach. Many important physics systems involved coupled oscillators. Coupled oscillators are oscillators connected in such a way that energy can be transferred between them. The motion of coupled oscillators can be complex, and does not have to be periodic. However, when the oscillators carry out complex motion, we can find a coordinate frame in which each oscillator oscillates with a very well defined frequency..
A solid is a good example of a system that can be described in terms of coupled oscillations. The atoms oscillate around their equilibrium positions, and the interaction between the atoms is responsible for the coupling. To start our study of coupled oscillations, we will assume that the forces involved are spring-like forces (the magnitude of the force is proportional to the magnitude of the displacement from equilibrium).